Oak trees allowed native Ohlone people to exist on this land for thousands of years without agriculture. 2017 marked the 100-year anniversary of the Jack London Oak’s installation out front of City Hall. Long before Europeans arrived in the East Bay, oak trees allowed native Ohlone people to exist on this land for thousands of years without agriculture. The annual abundance of acorns provided a source of reliable and easily stored food. Groves of these life-giving trees were sacred. Waves of genocidal colonization, followed by industrial development, drastically altered this region, but oaks are still everywhere. They provide lush, green cover for the hills and dot the parks of the flatlands. From the city flag to the ubiquitous Oaklandish logo to the name of the city itself, Oakland lives up to its name. Given this long-held, communal sense of pride in the oak, it could be assumed that most people in Oakland would know the name of the city’s most iconic tree — but this is not the case. If you don’t, don’t feel bad: the plaque commemorating the Jack London Oak at Frank Ogawa Plaza near City Hall has been missing for decades. The good news is that a new plaque detailing the history of this tree will be installed on site within the next few weeks, thanks to the Alameda County Historical Society and a group of local Jack London fans. On January 28, 2017, this coalition held a ceremony to mark the 100-year anniversary of the tree’s installation. 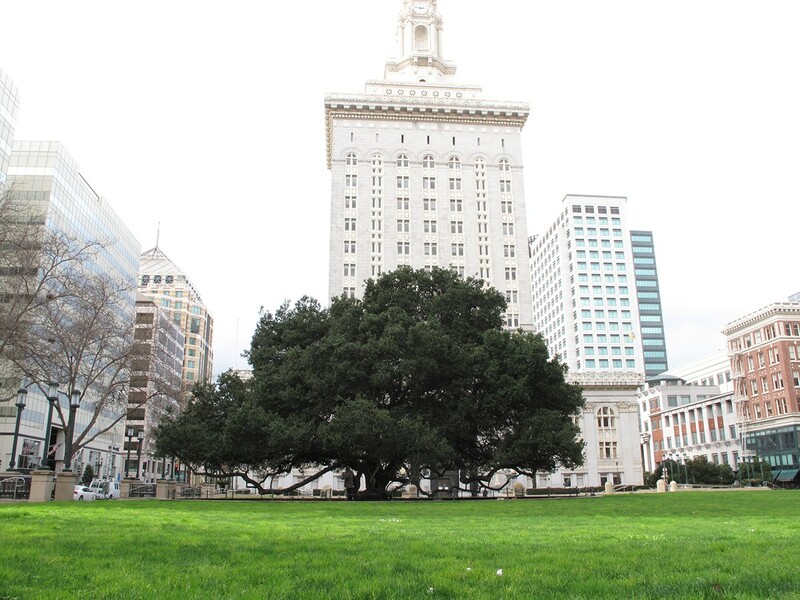 The coast live oak (Quercus agrifolia), which had been moved from its original location in Mosswood Park after growing there for about two decades, was planted in front of City Hall by Mayor John L. Davie to honor Oakland’s most famous author, who died in November 1916. Davie called the tree a “sturdy sentinel [that] may stand in memory and honor to Jack London,” in a resolution that he read at the ceremony. Learn more and listen to the East Bay Yesterday podcast at EastBayYesterday.com. Is the giant electrified cross on public property merely a depiction of Christianity? The rhythm and blues pioneer, who has been rocking the Bay Area since the 1950s, looks back at a wild career ahead of two rare concerts.